The 2017 World Jr A Challenge is two days deep into competition. Yesterday TEAM USA and the Swiss National team hit the ice with both team suffering losses in tight games. USA gave up a late goal to The Czech’s and the Swiss lost after fighting back from a 3-1 deficit. Canada East record now sits at 1-1 and we spoke to 2018 NHL Draft prospects Mason Snell from the Wellington Dukes and the Toronto Jr. Canadiens’ Jack McBain. McBain scored in yesterdays game and we spoke to him about his impressions so far. He noted that playing in the Ivan Hlinka tournament prepared him for the increased pace of this tournament. 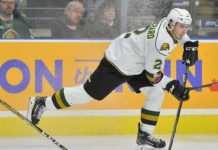 We asked McBain if he had done any work on his skating which has improved going back to his OHL Draft year. McBain told us he worked with a skating coach, Dawn Braid, this summer and raved about how she broke down his mechanics. He is still working to improve his first few steps. We like McBain’s hockey sense and he also felt it was a strength in his game. Mason Snell is a defenseman, and with Canada East carrying eight players at his end of the bench, he is currently fighting for icetime. 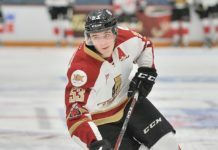 His lack of icetime has left several NHL scouts we’ve spoken to scratching their heads, based on the poor play of some of the d-men logging minutes ahead of him. We spoke to Snell after the loss on Sunday to Russia and he focused on the positive and said he just wants to help his team win anyway he can. We’ve seen Snell play going back to minor midget AAA, the Penn State commit is strong defending off the rush, utilizing his good feet. He also possesses a good shot which he used to score off a one-timer in one of our viewings of him with Wellington. Snell told us he wants to continue to make strides in his play on the rush. He mentioned that he feels like when he joins the rush he makes an impact and wants to incorporate that strong play when leading a rush. When we asked about his play defensively, he echoed our comment above about being very effective against the rush. Russia had an easy victory in their first game versus Canada East and one player who impressed was Grigori Denisenko. 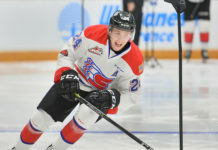 On our NHL Draft rankings released back in early November, we ranked Denisenko 10th overall and he showed off some of the reasons why on Sunday night. The skilled Russian forward scored a beautiful goal from in tight and later added an equally impressive assist with a slick cross crease pass. We will be releasing our updated NHL Draft rankings shortly after the completion of the World Jr A Challenge.